Nothing brings people together like a good food. But if you needed some food for your thoughts on how to tackle the Indian food & beverages industry in the years to come, ICF Knowledge Summit 2018 was your place to be. 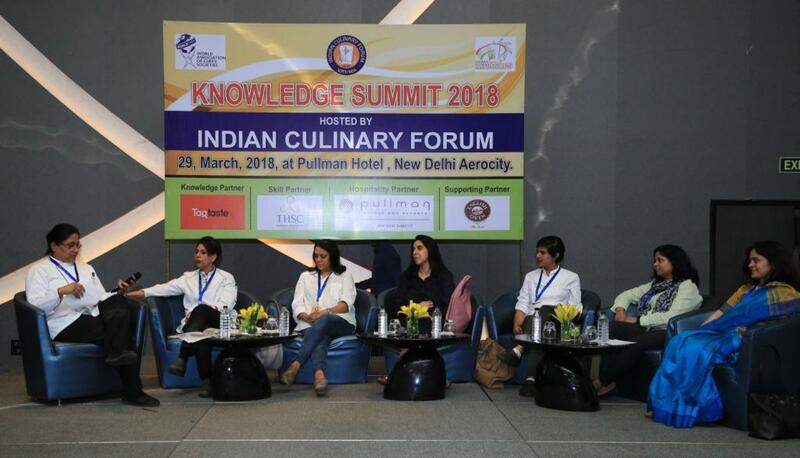 The summit was organized by Indian Culinary Forum in association with TagTaste as their Knowledge partner on 29th Mar 2018 at Pullman Hotel, Aerocity, Delhi. Hundreds of business leaders, farmers, chefs, nutritionists, consultants, marketers, MNCs and entrepreneurs from across India came together to listen to various industry stalwarts and veterans about their experiences and insights on the industry and various trends. The summit acted as a networking and knowledge exchange for all the members. Chef Davinder Kumar started the day by giving welcome remarks. Thereafter, Mr. Jaspal Singh Sabharwal, co-founder & CEO of TagTaste discussed the modern-day networks and their impact in our lives. He also highlighted how anybody can use these networks for their benefits. This was followed by panel discussions on various topics. In one of the sessions dedicated to farmers, Dr. GS Khalon, the pioneer in Citrus Horticulture in India and an advisor at Department of Horticulture, Punjab enlightened the audience about the aspects of citrus fruits, evaluation of new varieties and standardization of cultural practices for the control of nutrient deficiencies and fruit quality improvement. Chris Zandee, an automotive engineer from Netherlands who calls himself a farmer is an entrepreneur from the state of Jammu and Kashmir producing Himalayan food products. He shared his collaborative experience with the local Kashmiri community and how he created different flavours of cheese products. Chef Manjit Gill advocated for the cross-cultural collaboration of food and gastronomy. He shared his views on why we should promote Indian cuisines and their richness amongst the chefs as well as the masses in India. He highlighted that the Indian culinary traditions date back in the ancient times and carry through today and they represent the same principles which are found in different cultures around the world. Amongst various other things that were discussed were the techniques used in food retailing, HoReCa channel and food technology, and various insights that can maximize the opportunities offered by India’s vast consumer segment. As the business landscape gets more competitive and consumers get more demanding those with informed and first mover advantage will clearly have an edge. Staying ahead of the curve is no longer a choice but a necessity. The panellists shared how distribution channel differs in B2C and B2B model, our need to educate the customers beyond the product information, so that they are aware about the usage of product in different ways, how to discover the specific profit drivers of each product category and create focused commercial strategies leading to effective and efficient assortment tactics, how to improve margins by optimizing shelf-space allocation and improving productivity with the effective internal benchmarking techniques. Few farmers and entrepreneurs took the opportunity to showcase their products to the participants of the summit for their feedback as well as any possible business opportunity. Hopefully, few of those meetings will also convert in a long run mutually beneficial partnerships. Mr. Anuj Singh, Business Executive Officer at Nestle reflected upon the way forward in the food industry and concluded the day long summit. It was a great day to learn and reflect upon for the industry. With this, ICF announced that the next edition of this summit will happen soon. Stay tuned to know the dates and the way to register yourself for the same. The Indian Culinary Forum is India’s association of Professional chefs. TagTaste is the world’s first online community for Food Professionals to discover, network and collaborate with each other.